When Ismail Khan began shooting at a British Army lorry on a humid afternoon of February 15, 1915, few realized one of the most consequential events of World War I in Asia had just begun. This act signaled the start of a mutiny in which 850 soldiers of the 5th Light Infantry of the Indian Army rose up against their officers. Though the actual fighting was brief, the Singapore Mutiny was another nail in the coffin of the British Empire. The mutiny would also have important consequences for the nationalist history of India, the role of Japan in Southeast Asian politics, and Singapore’s security that resonate to this day. After seizing arms, groups of mutineers fanned out across the defenseless city. One group barged into the headquarters of the colorfully named Malay States Guides Mule Battery, a largely volunteer unit, and killed its officer. While some of the Malays were press-ganged into joining the mutineers others fled into the jungle. A British inquiry would later find this reaction “perhaps justifiable.” Another group of mutineers went to free a group of German POWs who were being held in the city. While a few of the Germans joined the mutiny, most – confused by the violence – balked. At the time Singapore was celebrating Chinese New Year, which meant that most of the city was caught off guard. For a moment the mutineers had control of Singapore within their grasp. Yet within two days the British had started to take back the city. This was in no small part thanks to important contributions from Britain’s wartime allies. Nearby French, Japanese and Russian warships responded to the crisis by steaming to Singapore and disembarking shore parties of armed sailors. To assist the British, Singapore’s Japanese Consul also raised 190 “special constables” who were promptly given British arms. A Japanese journalist writing a year later wondered if there was “significance to be attached to the fact that the flag of the Rising Sun was set up in the center of Singapore?” By coincidence, in 1942 Singapore would fall to Japanese forces on February 15, the 27th anniversary of the Singapore Mutiny. Some mutineers attempted to flee across to the Malay Peninsula. The Sultan of Jahore promptly dispatched his army to hunt them down. Others believed their best chance at escaping was to blend into Singapore’s multi-ethnic population. By May, all but a half a dozen mutineers had been accounted for. The mutiny had been suppressed at the cost of the lives of 47 British soldiers and civilians. The official enquiry held in the wake of the mutiny blamed a lack of discipline and poor leadership within the regiment as well as the agitation of the Ghadar Party. The Ghadar Party, founded by secular Indian nationalists in the United States and funded by Berlin, sought to achieve independence for India from British rule through rebellion. Ghadarists became part of a terrorist network that also included Irish Finnian agitators, and were linked to a number of terrorist attacks in British India as well as to the bombing of a munitions dump in the United States in 1916 that killed seven. Interestingly, the group’s activities are recognized today with holidays in several American cities. Nur Alam Shah, one of the leaders of the 1915 mutiny in Singapore, was exposed as a prominent Ghadarist during the subsequent trial of the mutineers. For some South Asian historians, the Singapore Mutiny is a sequel to the 1857 Sepoy Mutiny and an important milestone in the struggle for independence. The 5th Light infantry would be disbanded shortly after World War I after serving with the British Army in East Africa. 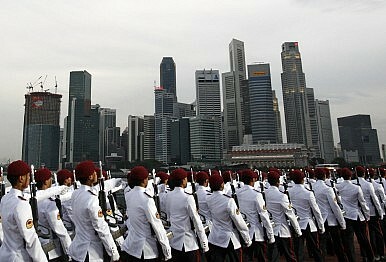 Yet, Singapore would again be the site of another important rebellion involving colonial Indian troops. In 1942, the fall of Singapore, placed 40,000 Indian troops of whom nearly 30,000 would join the anti-British First Indian National Army (INA) under nationalist leader Mohan Singh. That army collapsed but, a second INA under Subas Chandra Bose joined Japanese forces during the Burmese campaign. During World War II, similar but smaller units of Indian soldiers were raised by both Germany and Italy from among Indian POWS. The Singapore Mutiny anticipated similar revolts involving colonial soldiers in Southeast Asia in the first half of the twentieth century. In 1920, a mutiny of several English and Irish soldiers in the Connaught Rangers in 1920 would also be linked to the influence of the Ghadar Party. In 1924, Philippine Scouts units staged a non-violent mutiny over their mistreatment by American colonial authorities. In 1930, the French crushed the Yên Bái mutiny, which like the Ghadarist-inspired Singapore Mutiny, involved both civilian rebels and colonial soldiers. The events of the Singapore Mutiny would have a lasting impact on Singapore itself. In August 1915 the British introduced a “Reserve Force and Civil Guard Ordinance” requiring compulsory military service for all Singaporean men between 15 and 55 years of age. The law was an early forerunner of independent Singapore’s own national service law, which was enacted in 1967. In an article marking the 20th anniversary of the mutiny, the Straits Times in 1935 described the mutineers as “merely dupes of conspirators elsewhere,” presumably a reference to the Ghadar Party. The fear that residents of Singapore could become “dupes of conspirators elsewhere” has been a perpetual fear within Singapore’s security establishment. During the Cold War, Singapore fostered a paranoid fear of communism that resulted in the imprisonment of agitator Chia Thye Poh the longest serving political prisoner of the 20th century. Still, in a dynamic society like Singapore there is always room for change. Sentosa Island, where Chia Thye Poh once served part of his long prison sentence in a one-room guard shack has been redeveloped into a resort and tourist attraction.